Canva is an amazing online graphic design software. It works in so simple way. Canva is also available for iOS and browser. This simple app/software helps to edit pics, create beautiful design in professional way. This app offers simple and amazing tools to design graphics. In this content I’ll share a step by step tutorial how to Use Canva to design cover photos online for Social Media. You must try it as it’s totally free. But the material available is free as well as paid. It’s not a tough job making or designing graphics or documents using Canva. This App/Software provides all the tools designers or beginners need to create a design. Canva offers everything you need to create something stunning. Here are some basic tools of Canva. Canva offers a photo straightener tool to keep the photo in a line or at an exact angle. Now you can crop your photos to give them a new look and try best compositions. There are lots of options available in Grid tool. Users can use multiple grids to divide the image in half, quarters etc. There’s huge number of Frames available with multiple designs. Users can use plenty of frames to give awesome look to their pictures. It’s a fun to give some crazy look to photos using stickers. Users can get plenty of stickers with fun-filled memes and phrases. There’re wide variety of textured backgrounds available to give professional look to the images. If you don’t interested using a plain background, can choose a texture. Now, no more tough to create a vector design. Canva offers lots of Icons to create an awesome illustration or vector image. Now you can give a vintage or old film look to your photos using Canva. Users can give an amazing retro chic to their photos by applying some filters on vintage image. Users can make a part of their photos prominent by blurring the rest. They can also give some professional look to their image by keeping the edges soft. And this only possible by applying blurring effect on the edges. Now users can give a delicate fade by using Transparency tool. There’s also option to reduce the opacity of the image. Users can also mix two images by reducing the opacity of one image. There’re lots of Fonts available to write on image. Users can choose their favorite font with desired size. There are options available for “Title”, “Heading” and “Paragraph”. They can also change the color of text background. Also they can reduce the opacity of background color. 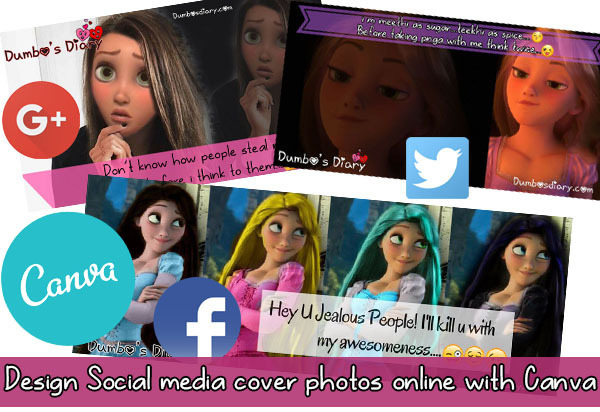 Here’s a step by step tutorial how to use Canva to design cover photos online for Social Media. I have made G+, Twitter and Facebook cover pages online. You can also make cover pages for Instagram, Pinterest, Tumblr etc. First of all Visit Canva Website. You need to “Register” yourself with Canva. There’re options available “Sign up with Facebook”, “Sign up with G+”, “Sign up with Email”. SignUp Complete. Now choose “Personal“. Now you have entered Canva. Choose “Banner” if you want to make cover photos for social media. Here you need to choose the social media for making header or cover. But remember you can choose only one social media at a time. I’m going to make cover photo or header for G+, Twitter and Facebook. From “Layouts” you can choose layout for FB cover free as well as paid. There’re plenty of layouts available. I’m going to upload my own image. So i’ll go to the option “Uploads“. Then click “Upload your own images“. Here I uploaded the image. Click the image and you’ll get the image ready to make as FB cover. Now i’ll write text on the image. For that click on “Text“. Then choose the option from “Add heading“, Add subheading” and “Add a little bit of body text“. I chose “Add heading“. Now choose any design from a variety of available designs for text. I chose yellow one. You can also change the background color of the text. I shown the option by arrow. I chose the color “White“. Because my text will be more prominent on this background. Now by clicking the “Transparency” option you can reduce the opacity of the text’s background. You can also choose the text color. I chose “Black“. You can also choose “Font” and “Size of font” of your choice. Here’s the image after writing text. You can also put some illustrations along with text to decorate it. Go to “Elements” then “Illustrations“. I chose a “Butterfly“. The image is done. Now time to download it and save in your device. For that go to “Download” then choose any format you like. I chose first one “Image: for Web(JPG)“. Choose the folder of your device where you want to save the file. Then click “OK“.